The default invitation paper is set for semi-gloss or you may choose matte no sheen paper which is also a heavier stock. Pretty rose and pink poinsettia flowers, vines, green leaves, berries and branches make up our Christmas holiday decorative invitation topper on a light beige background. 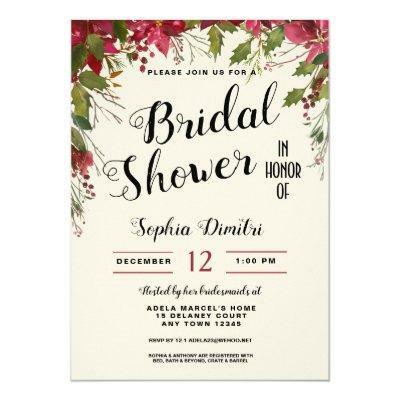 We used a variety of font choices to add a unique look for your honoree&#;s bridal shower invitations. See more at Heart Song Notes here at Zazzle.